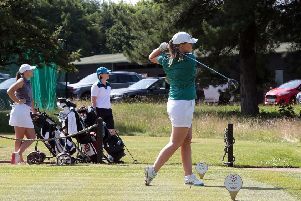 Nottinghamshire golf pros William Davis (Nottinghamshire GC) and Shane Peacock (Oakmere Park) will both be competing in the PGA England & Wales Inter-County Championship qualifier at Nuneaton Golf Club. They will compete against the likes of Cameron Clark and Lee Clarke at the matchplay championship, which begins on Thursday. The championship, the newest on The PGA’s national tournament schedule having first been staged in 2013, will culminate in a £10,000 final over the Belfry’s PGA National Course on October 13-14. Other counties competing in the regional qualifier at Nuneaton include: Lincolnshire; Adam Keogh (Spalding), Scott Emery (Woodhall Spa) and Daniel Greenwood (Forest Pines); Northamptonshire; Jon Handyside (Priors Hall), David Poolton (Collingtree Park) and Matthew Hodgkiss (Brampton Heath); and Staffordshire; Daniel Higgs (Walsall), Simon Lynn (Trentham Park) and Mark Butler (Mark Butler Golf Academy).